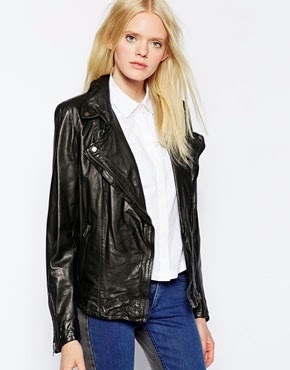 There was only one item I had earmarked that I wanted to try and snag in the sales and it was a leather biker jacket. I even told the Hubby not to buy me a Christmas present as I wanted to make a big investment purchase in the sales. Once those sales emails starting pinging away I checked the websites of the 2 brands I was hoping to purchase the said item from which were Whistles and Jigsaw only to find they weren't offering any reductions on the leathers I was after. So I shelved the idea. Thought I might wait for a Grazia/Whistles 25% off. That was until a little beauty was brought to my attention thanks to an ASOS further 10% off sale items email that just happened to land in my inbox! This MuuBaa jacket was originally £375, I paid £116.10! I feel like a have won the lottery as it is that amazing! It's lovely soft leather, it has very little detailing on it which is right up my street....less is more right?! I bought the size 10 which is perfect as I can still get a couple of layers on with it but it still looks lovely and fitted! MuuBaa is a brand I would thoroughly recommend if you are in the market for a biker jacket, this one is sold out now but they still have other styles that are well reduced. I will warn you....this is just the tip of the iceberg purchase-wise so far this month! 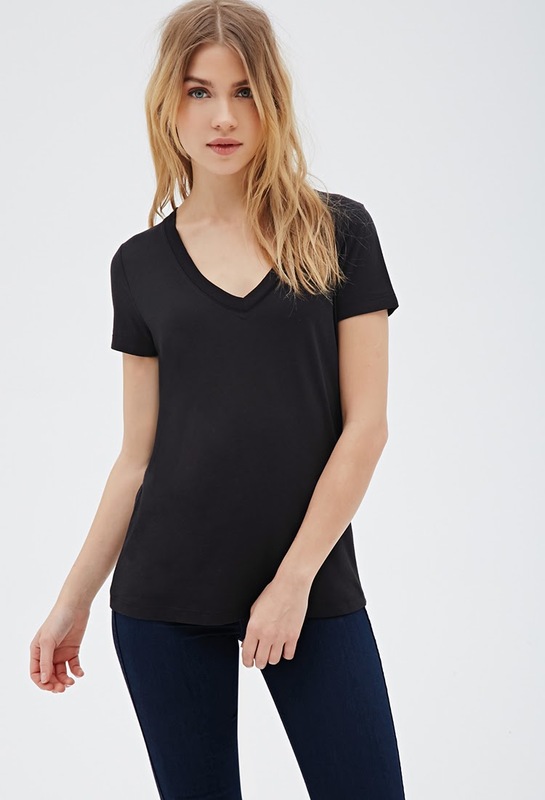 I have been pretty lucky in the sales and I've stocked up on a few full price basics too! Before Christmas I was searching high and low for a faux fur coat.....that search turned out to be a castastrophe as not only did H&M manage to lose my essential order, when it was re-ordered and delivered successfully, the 8 year old daughter wasted no words in telling I looked like a monkey in it.......what the DH said isn't even printable so back it went! Can't fault the H&M customer service though as they offered discounts and free deliveries for the one that went missing, they were really rather excellent. Moving along swiftly though......I was still a bit obsessed with finding me some faux fur, so I did end up purchasing a fur gilet in the Zara sale which has been a roaring success as it was worn immediately! I was hoping that this would look fabulous over the biker jacket, however it is knitted on the inside and it slides straight off the leather! Luckily the Damart gilet is perfect over the biker jacket so I still have that box ticked as such! Anyway, the gilet looks amazing over an all black ensemble just like in this picture. 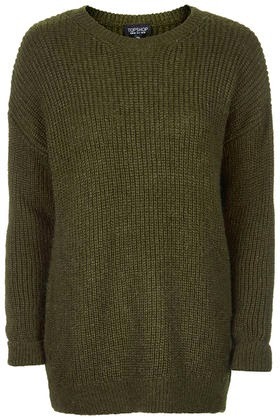 Sadly none left on the Zara website but can be purchased on Ebay, albeit at a v.inflated price. I paid £39.99 from Zara. Another sale bargain I could not pass up was this good old black and white stripe top which you can never have too many of! This one has long sleeves and is long in the body, it is perfect for layering and was a steal at £5.99 Another winner from Zara. 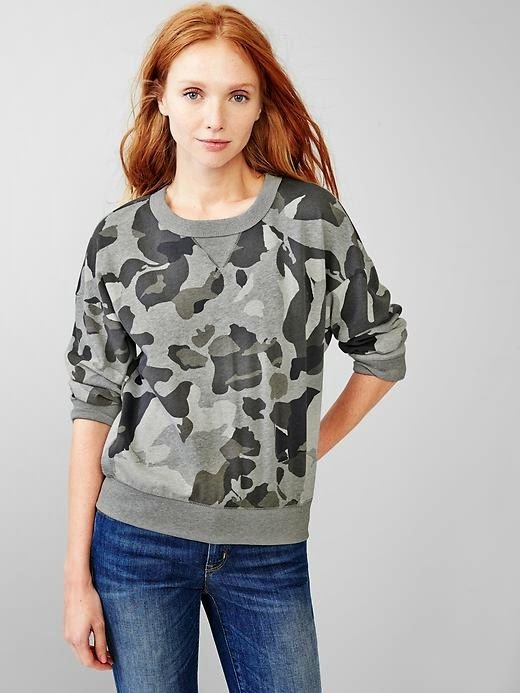 Last of the sale bargains was this Gap camouflage sweatshirt which my lovely Midlife Fashion friend Jane has here. The Hubby had a credit note which was running out and this top ended up costing £2.01! Couldn't leave it behind at that price. I think it was actually £9.99 in store and it had a further 20% off. Not unusually for Gap it's more expensive on their website! Tut-tut Gap!! This looks great under my favourite coat of the season, this Topshop one and the new H&M jeans which we'll come to in a minute! The rest of my goodies were all full price but again great basics that have just slotted into my current wardrobe enhancing what is already in there! My love affair with an oversize knit continues after the success of my Zara grey sweater (see here), Boden Off Duty sweater that I managed to pick up at a Boden clearance sale a few months back (see here, similar here) and a Gap navy turtleneck sweater I bought back in December. I couldn't really pass on this Topshop fisherman's style jumper which I had seen on a couple of blogs (School Run Style here and Re:style here). Even though I do say so myself, this colour is great on me....I need more of it in my life! Already worn it twice so it should do well on the pay per wear! The perfect time to inject here that I purchased another basic sweatermin the way of a Uniqlo merino roll neck (as seen on my last post) in black size large for a slouchy look! Roll neck perfection! Sold out! So sorry I didn't let you know sooner as it is awesome, an absolute wardrobe staple! Speaking of more basics......I've been in the market for investing some good quality basic tees for sometime but after a conversation which the lovely Sue she assured me these £3 tops from Forever 21 were the best she has come across and we know she will have tried and returned a few ;0) So I took the plunge and now have the black, white and grey in my possession! Thanks for the tip off Sue....these are fab! This next acquisition was a replacement item. I managed to get bleach on one of my favourite pair of jeans :0( The Topshop Jamie's were about 2 years old but they were a brilliant grey colour (they are now black thanks to a bit of Dylon, so all is not lost) were high-waisted, super soft and v.comfy indeed! Anyhoo! 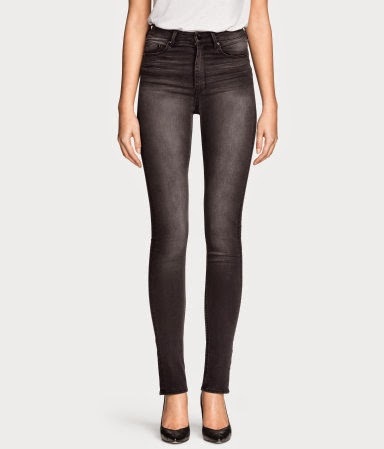 I managed to find a great alternative in these H&M High waisted skinnies, they are more of a washed black but they are as good as it gets and I think this colour will possibly be a tad more versatile if I'm honest. They were £24.99 but I had a £5 off voucher which took them down to £19.99. Last but not least.....I treated myself to a bit of bling since I saved the DH so much on the leather biker jacket! 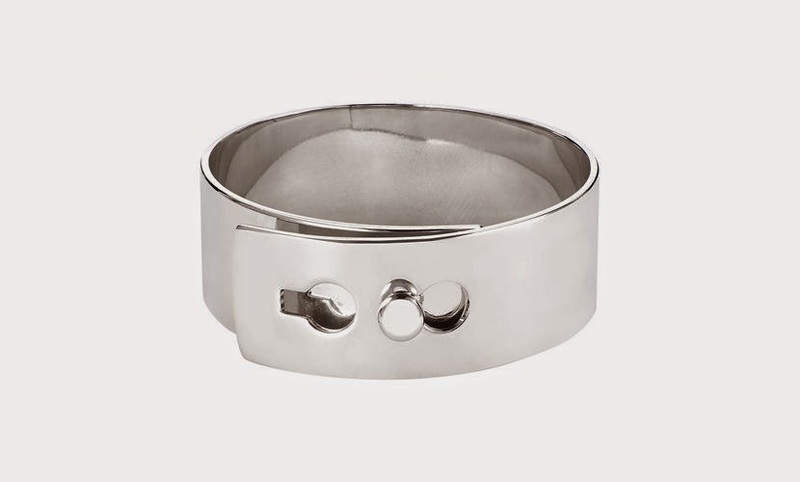 First up I spotted this fab silver bolt cuff from Whistles. I do love my cuffs and I didn't own a plain silver one so this was a must! My second jewellery score was this Reiss Frith leather weave bracelet which I've had my eye on for sometime but had forgotten to pop on my Christmas list! It is mine at last! Yay! Bizarrely what I have noted here is there has not been one footwear purchase here......unheard of!! But!! The black Converse hi-tops have been my go-to shoe.......to the point I can never imagine wearing anything else?! I am glued to Pinterest to try and find my next fashion footwear obsession but there are no clues?! I need help here ladies please!! A round-up of what I've been donning these past few days.....it's features some of the wardrobe newbies!! Excuse this pic! This is the perfect example of why I don't ask my DH to take my photo v.often! I am now 'clothed' out for a while! It's time to have a bit of a wardrobe purge and get eBaying to recoup some funds ready for any new Spring wish-list items. Anyone got a Spring wish-list going yet?